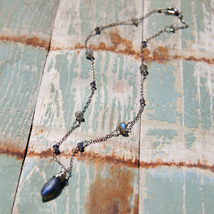 Labradorite drop topped with sterling silver crazy-wrap hangs from a chain sparked with labradorite and iolite rondelles. Closes with lobster clasp. All silver is sterling. Necklace is 18" long. Pendant is 1 inch. 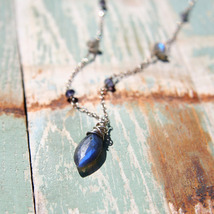 .......................................... Labradorite is said to banish fears and insecurities and strengthens faith in the self and trust in the universe. It calms an overactive mind and energizes the imagination, bringing up new ideas. 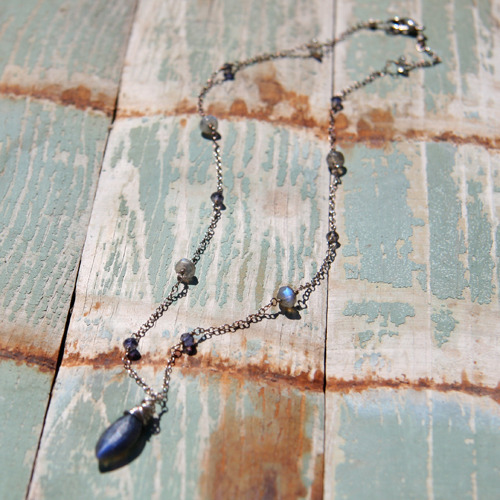 Traditionally, labradorite is thought to bring good luck. .......................................... This necklace is hand-made to order. Slight variations are the nature of handmade jewelry and make each piece special. It will be shipped with a complimentary organza gift bag. If you prefer a gift box, please let me know in the Notes box at checkout. If you are purchasing a gift that you would like shipped directly to the recipient, I am happy to include a personal message from you. In the Notes box of the order form, mention "giftshipper" and include the text of your note.